The rapid growth of smartphone market around the world has incentivized some manufacturers to make clones of popular smartphones for easy money. It has become common to come across clones of popular smartphones in local markets and shady online marketplaces. 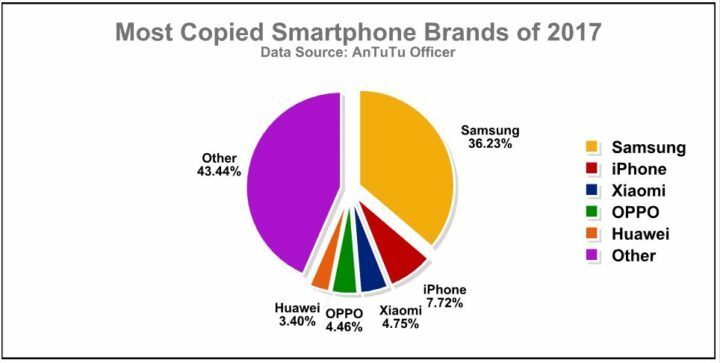 New data from Antutu offers some interesting insights about the popularity of smartphone clones. Antutu is a Chinese software benchmarking tool used to rank smartphones. Chinese manufacturers are often extremely quick in cloning popular Samsung devices. For the Galaxy S9 and Galaxy S9+, they have released clones even before the devices are officially announced by the company. 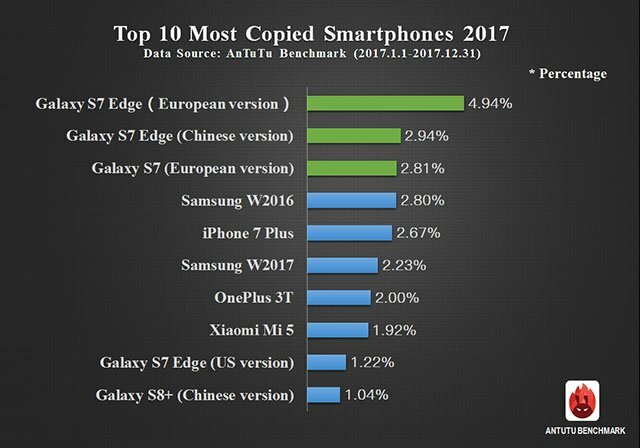 According to the Antutu’s report, Samsung was the most cloned smartphone brand in 2017. Antutu’s report states that an estimated 17,424,726 smartphones were inspected in 2017, of which smartphone clones accounted for 2.64%. Of the total cloned smartphones, Samsung was the most cloned brand at 36.23%, followed by Apple at 7.72% and Mi at 4.75%. The European version of the Galaxy S7 Edge emerged as the most cloned model, followed by the Chinese version of the same model. Samsung Galaxy S7, Galaxy S8+, Galaxy W2016, Galaxy W2017 were the other popular Samsung smartphones that were cloned. While the Chinese smartphone market is not very keen on Samsung smartphones, it seems the smaller manufacturers in China are extremely interested in making clones of popular Samsung smartphone to cater to other Samsung-dominated markets. Apart from the ethical questions involved, smartphone clones also represent security and privacy risks to the users. It is a more sensible decision to buy an original mid-range or budget device rather than a buying a clone of a high-end smartphone. Other than a poor resemblance to a popular smartphone, clones don’t offer any of the advantages associated with the original models. Buying from a reputed sales channel is the easiest and the safest way to avoid being scammed by clones. Considering Apple and other Chinese OEMs are doing fine in spite of the clones, Samsung’s troubles in China cannot be because of clones. My opinion is that Samsung lacks strong mid-range and budget options compared to the Chinese OEMs. Most of the market growth is happening in those segments in China. What are you talking about? Samsung already has an economic lineup such as the J and even A series. As a matter of fact, the flagship devices are even cheaper than Apple’s iPhones. Forget about Apple because that’s a different game. The J and A series are really good phones but still more expensive than their competitors in the same price range. Just an example, On Amazon the J5 and J7 with just 16GB and 2GB of RAM costs more than many other phones in the same price range and sometimes cheaper which offer 64GB, 4GB and even fingerprint sensor. J, C and E are the budget range – A series is pushing into upper mid range. the Cs are exclusive to China with pretty big RAMs and batteries for their time. A new C device should be coming soon.